Waubgeshig Rice may be familiar to you if you watch CBC TV in Manitoba. A few years ago, Waub worked out of the Winnipeg newsroom and now hosts Up North on CBC Radio in Sudbury, Ontario. Moon of the Crusted Snow is his third book and he is gaining a stronger hand at story-telling with every new book. The novel is set in a northern, somewhat isolated (there is a road in) reserve community. All of a sudden, the power goes out and the internet drops out and the connection to the south is lost. Is this a short term drop out in service or is something else going on? Our main character Evan works for the band and also has a young family who look to him for guidance. So the power is out–get outside and play, turn away from the TV, and put down the cell phone. We have seen this before. But winter is coming and the power does not come back on. Who is prepared for no power? Who stills knows how to hunt and gather food and fuel for the cold days? How will the community react, who will look after the weak and the elderly, and what does this mean for a community? Rice explores all of these questions through the novel. The creepy factor sneaks in slowly through the book and we are asked to go on the rounds with Evan and the band council and community folks as the “new reality” sinks in. What further menaces will enter the town or will the meances come from within? Rice does not give us a full explanation of things but rather leaves room for the reader to think for themselves: how would I react? How would my neighbours? My town? 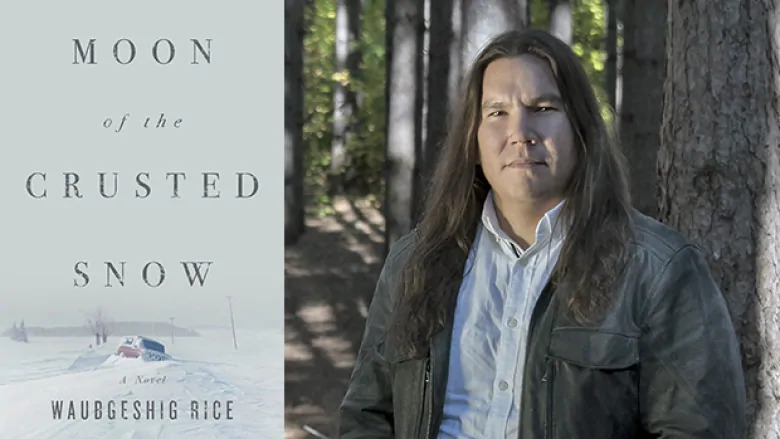 A year ago, at the Saskatchewan writers’ festival in Moose Jaw, Waubgeshig Rice was a panelist and an interviewer. I very much enjoyed meeting him and hearing him in conversation with Harold Johnson (author of Firewater and Corvus). Waub’s is a thoughtful and sincere mind that is being shared through his writing and his public engagement through his media work. Give him a listen or spend time with his books!